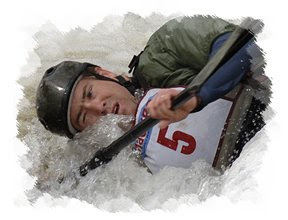 The 2013 Maine whitewater season continues with the Passy River Race in Waldo (near Belfast) this Saturday. Just a little over two weeks remain until the Kenduskeag! Place: Savage Road, Littlefield Farm in Waldo, Maine. Course: Race starts at the Littlefield Farm. The first mile is flat water with many curves. Course passes under a cement bridge to another mile of flat water followed by a short stretch of Class II rapids. A two-mile stretch of flat water to the Rolerson’s bridge, then Class I, II and III whitewater for a mile and a half, leading to a flat water stretch to the finish. For more information, visit the Waldo County YMCA website. 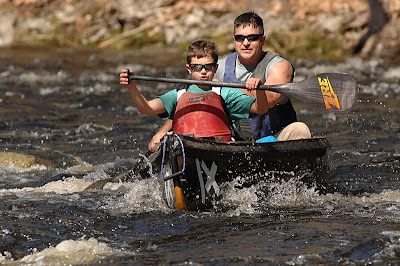 The Passy River Race is scheduled for this Saturday, April 2nd, at 11am. And so is an early April nor'easterner! Good thing I didn't put my snowplow into storage; we could see several inches of snow or rain (or both) on Saturday morning. It won't stop a bunch of people from having a good time on the water, however. Course: Race starts at the Littlefield Farm. The first mile is flatwater with many curves. Course passes under a cement bridge to another mile of flat water followed by a short stretch of Class II rapids. A two-mile stretch of flat water to the Rolerson’s bridge, then Class I, II and III whitewater for a mile and a half, leading to a flatwater stretch to the finish. Call (207) 338-4598 to register, or stop by the Waldo County YMCA. Cost per paddler is $20, first 180 registrants will receive a t-shirt. Register for the race and be entered in a drawing for a brand new Old Town canoe! The Passy River Race on Saturday was a blast. The weather was beautiful (I have a mild sunburn to prove it) and the water was truly inviting. Over 100 paddlers participated this year. It was nice to see so many young paddlers involved in this year's race. 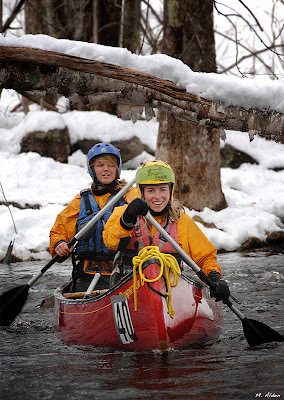 In part, this is clearly the result of hard work by the Maine Canoe & Kayak Racing Organization (MaCKRO) to engage young people in the sport of paddling. If the St. George and Passy River races are any indication, these efforts seem to be working! I've posted some race photos here. Next Up: Passy River Race! season begins near Belfast on Saturday, April 3rd at 11am. Registration: 8:30 - 10:30 a.m.
Race Location & Directions: Take Rte 7/137 NW out of Belfast. After about 3 miles, take a left on Shepard Rd. (Side note: about a half mile up Shepard Rd is where the race ends, at a spot where the river comes close to the road. You'll see lots of cars and paddlers and if in doubt, just ask someone where the start is!) Continue up Shepard Rd. At the stop sign, bear right onto Poors Mill Rd, then after about a half mile, bear right again. Continue across the bridge on Poors Mill Rd, and after about 1.5 miles, bear right onto Savage Rd (a dirt road). The start is about a half mile up Savage Rd where the river goes under the road. Course:Race starts at the Littlefield Farm, first mile is flat water with many curves. Course passes under a cement bridge to another mile of flat water followed by a short stretch of Class II rapids. A two-mile stretch of flat water to the Rolerson’s bridge, then Class I, II and III whitewater for a mile and a half, leading to a flatwater stretch to the finish. According to race director Dale Cross, "...this river also finishes with about a mile straightaway, very wide. It’s like a stock car finish. You can see people all around you, so it’s really cool. Several boats wide could finish at the same time." (Source for Dale Cross quote: Bangor Daily News article). Stop by the Waldo County YMCA to register for the St. George or call (207) 338-4598. Waldo County YMCA canoe race page. This Week: St. George River Paddling Clinic & Race! If you're looking to try out a race or just get your sea legs back, the St. George River Race is just the ticket! This season-opening race is always a lot of fun and there are prizes to be won. And as the St. George Race is a good 10.5 miles shorter than the Kenduskeag, it's the perfect "primer" race. But wait! There's more. 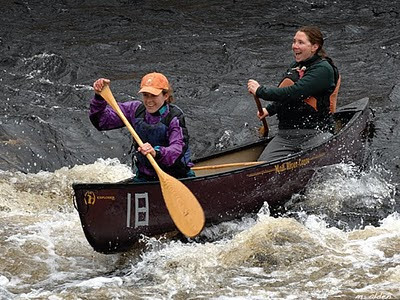 If you are new to paddling and you want to prep yourself for any of the races this spring and summer (including the Kenduskeag, of course) you can try out a paddling clinic hosted by the good people at MaCKRO (Maine Canoe & Kayak Racing Organization). You will have to fill out an American Canoe Association (ACA) waiver form, which I have provided links for right here. You can download the waiver forms for both minors and adults. (These are PDF documents). St. George River Race (Paddling Clinic): Thursday, March 25th at 4pm, Searsmont. Bring the applicable waivers and your boat. Clinic is free. Experienced paddlers will guide you through the stream at your own pace. Designed for fun and for building confidence! St. George River Race - Saturday, March 27th at 11am at Searsmont. Today is the first day of spring. Technically. 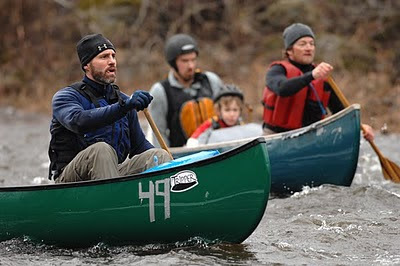 And here are four races in Maine leading up to the Kenduskeag Stream Canoe Race on April 19. 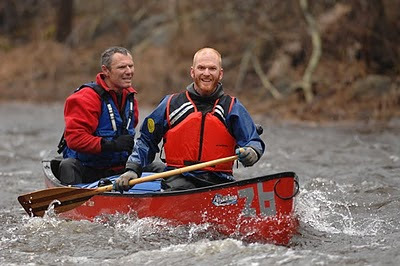 Saturday, March 29 - St. George River Race (Searsmont) - 11am. Three miles of dead water, 1-mile rapids, 2-miles dead water and curves with one Class III drop. 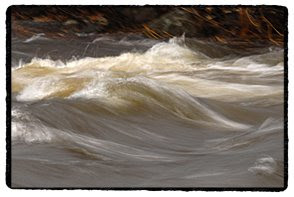 This race has Class II-III rapids + or - depending on the water level. Phone 338-4598. Editor's Note 3/30/08: St. George River Race photos and video have been posted on the Village Soup website. Saturday, April 5 - Passy River Race (Belfast) - 11am. Race starts at the Littlefield Farm, first mile is flat water with many curves. Course passes under a cement bridge to another mile of flat water followed by a short stretch of Class II rapids. A 2-mile stretch of flat water to the Rolerson’s bridge, then Class I, II and III whitewater for a mile and a half, leading to a flat-water stretch to the finish. Phone 338-4598. - The St. George River is ready to be run and at a very safe level as of Tuesday, March 18. - Free hats available to all who register. - Free longsleeve t-shirts available to all who register. 9am (sprint), 12pm (race). Phone 234-4521. Sunday, April 13 - Marsh Stream Sprint and Race (Frankfort - Winterport Snowmobile Club) 9am (sprint), 12pm (race).